These Playing Card Sets feature one red deck and one blue deck of Royal Brand 100% Plastic Playing Cards in a custom-imprinted vinyl case. Royal All-Plastic Playing Cards have been one of the leading brands of Plastic Decks on the market for decades, and these high quality, durable card sets can be used for years to come. Each Two-Deck Playing Card Case Set features a snap-shut case that measures 3-3/4" wide x 5-1/3" long. 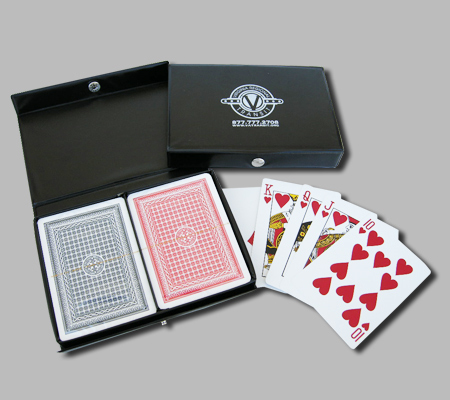 The Playing Card Cases can be custom printed on top with any one-color design/message you choose.